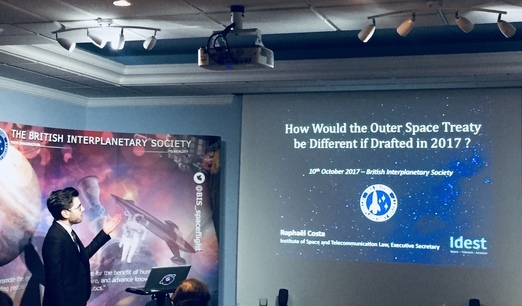 This paper was presented at The Outer Space Treaty Symposium at the British Interplanetary Society in October 2017. One of the fascinations of Star Trek is that, right from the start, it portrays a coherent and consistent background to the interstellar adventures of the characters. Their missions are set in the broadly brushed yet intriguing setting of Starfleet and the United Federation of Planets. One frequent element of the setting that is portrayed is the law and it is surprising that Star Trek, a science fiction TV show for a mainstream audience, includes the law as often as it does. In common with other dramas, Star Trek uses legal principles and disputes to bring characters into conflict or add tension to the plot. The beginnings of the Prime Directive are explored in episodes of Star Trek: Enterprise (“STE”). In Dear Doctor, Captain Archer faces an agonising decision in which the lives of millions are at stake. Eventually he decides that if he interferes, this would contravene their underlying mission of peaceful communication and exploration. They were not travelling through space to “play God”, he decides. Later, in terms of Star Trek chronology, episodes of Star Trek: The Original Series (“TOS”) give an idea of how serious the results of breaching the directive can be. For example, Patterns of Force depicts an alien world distorted by the teachings of a Starfleet history professor into becoming an almost exact copy of Nazi Germany, with appropriately catastrophic consequences. In the episode The Omega Glory, Captain Kirk explains that adherence to the Prime Directive is so vital that a Captain should be prepared to sacrifice his own life and possibly even that of his crew to ensure it is upheld. Notoriously though, the principle is more often honoured in the breach than the observance, especially in TOS. In Star Trek: The Next Generation (“TNG”) and later Star Trek shows, the Prime Directive is taken more seriously. In Symbiosis, Captain Picard comments that it is more than just a set of rules, “it is a philosophy”, and a very correct one too. The stronger application given to the Prime Directive ensures the heightening of the moral dilemmas the Starfleet crews have to contend with. 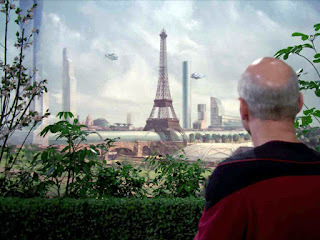 One of the most shocking examples of the ramifications of the Prime Directive is in the TNG episode Homeward, in which Captain Picard orders that they must do nothing to save an entire civilisation doomed by a planetary atmospheric collapse. The Prime Directive is the most fully developed legal principle that Star Trek, in all its TV shows, presents and the episodes in which it features usually depicts a novel twist on its application. This has lead to an intricate series of exceptions and modifications in different situations. In the Star Trek: Voyager episode Infinite Regress, we are told it has 47 sub-orders. 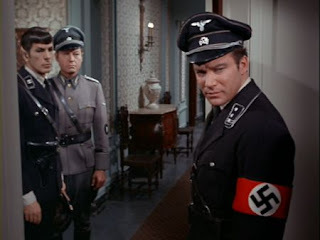 It first appeared in TOS and it is interesting to consider its origins during the time TOS was created and broadcast. This was a time of almost revolutionary protest amongst the young in the USA, particularly with regard to the Vietnam War. It is not difficult to conclude that the Prime Directive might have been in part inspired by the hope that non-interference was a more preferable and ethical policy than the unrelenting agony of the Vietnam conflict. More broadly, it can also be seen as reflecting underlying American historical concerns, such as an opposition to colonialism and imperialism and unease with interference in foreign affairs generally, such as the isolationism of the USA prior to entry into World War Two. Environmentalism as a movement grew substantially in the sixties, in part due to the accelerating space program and its images of the Earth as a fragile, natural world without borders. The Prime Directive can be viewed as having an ecological aspect to it as well. The less technologically advanced cultures that Starfleet discovers and the worlds they inhabit can be taken as natural species in ecosystems that are to be respected and valued for their own sake. These parts of the galaxy are to be left alone and not subjugated, colonised or exploited. Instead they are to be left to develop naturally, albeit allowing for some limited scientific monitoring. What is immediately noticeable here is that TOS, the first Star Trek show, and the Outer Space Treaty were both developed and then came into existence at roughly the same time. 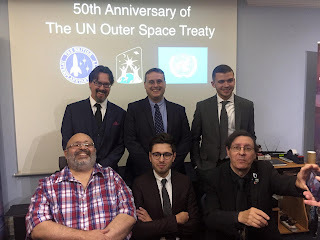 Like the Antarctica Treaty system that came into force in 1959, the Outer Space Treaty is most importantly a disarmament treaty, outlawing the placing of weapons of mass destruction in outer space. The preamble of the Treaty requires that the exploration of space must be for peaceful purposes, which reminds us of the earnestness of Captain Archer in STE that this be so. Article 1 of the Treaty states that the exploration and use of outer space is the province of all mankind. Article 2 develops this further, stating that Outer Space (which includes the Moon and the planets) cannot be subject to national appropriation by a claim of sovereignty, including by means of use or occupation. Article 9 of the Treaty requires that nation states will avoid harmful contamination of the Moon, the planets and other parts of outer space when exploring them. 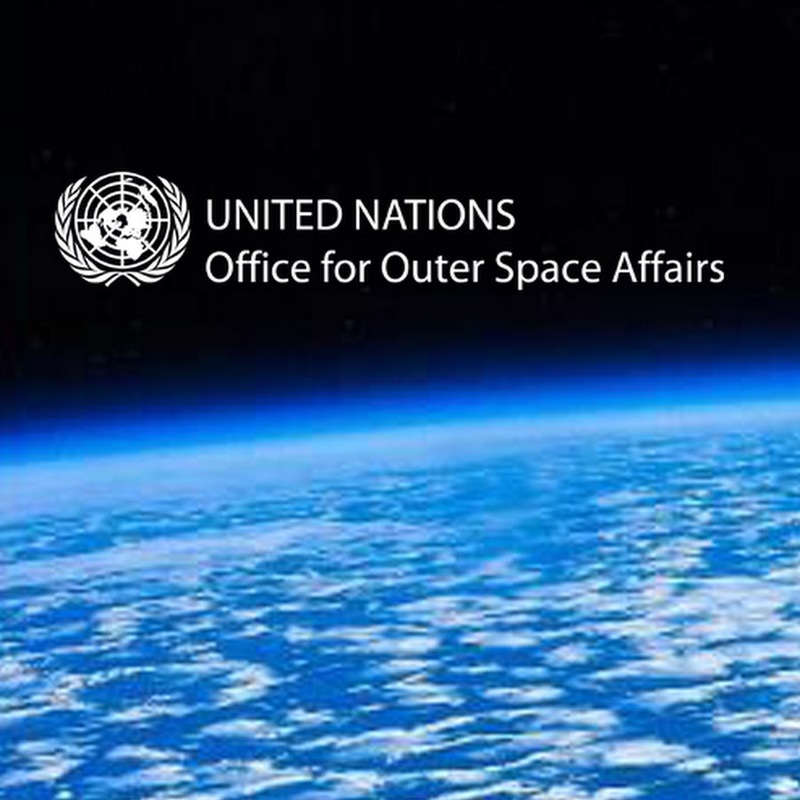 Articles 2 and 3 of the Moon Agreement reiterate the requirement that all activities in space are to be carried out in the interests of maintaining peace and for using space for peaceful purposes. Article 7 repeats the requirement on state parties to take measures to prevent the disruption of the Moon and other celestial bodies by avoiding the introduction of adverse changes or harmful contamination. Interestingly, Article 7 goes onto say that state parties shall report any areas on the Moon or other celestial bodies that are of particular scientific interest. This could lead to the designation of such areas as scientific preserves, which will receive special protective arrangements by the United Nations. The prohibition of any claim of sovereignty or ownership found in the Outer Space Treaty is echoed in Article 11 of the Moon Agreement. This important provision begins by stipulating that the Moon (which is defined to mean the Moon and all other celestial bodies and areas in outer space) and its natural resources are “the common heritage of mankind”. This phrase denotes outer space as being a realm that cannot be appropriated by acts of ownership. Further provisions of Article 11 list additional elements of the principle of the common heritage of mankind. Paragraph 3 of Article 11 states that neither the surface, the sub-surface nor any part or any of the natural resources in place shall become the property of any state, non-governmental entity or any natural person. So, not only is the ownership of land prohibited, so is the ownership of the physical constituents of that land. This total prohibition on any form of ownership is mitigated by the rest of article 11’s delineation of an “international regime” which seeks to moderate and restrain the exploitation of extraterrestrial natural resources to ensure the common heritage principle is applied. The purposes of this regime include ensuring the orderly and safe development of the natural resources of outer space and the expansion of opportunities in their use. The final purpose set out for this international regime is that it shall include an equitable sharing by all state parties in the benefits derived from these resources. This is to ensure that the interest and needs of developing countries (which may not be space faring nations) are given special consideration. Whilst the Moon Agreement can be viewed as a failed treaty as it has not been ratified by a sufficient number of countries, it provides an explication of the Outer Space Treaty’s initial outline of the common heritage principle to space. The Moon Agreement has been adopted by the United Nations and, arguably, still represents an important source of legal principles. 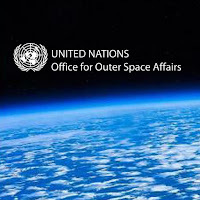 The United Nations remains the body that the world's nation states have accepted has the competence to legislate on matters involving Outer Space from the perspective of international law and, accordingly, as legislation emanating from the UN, the Moon Agreement remains of importance despite the failure to ratify by a sufficient number of states. 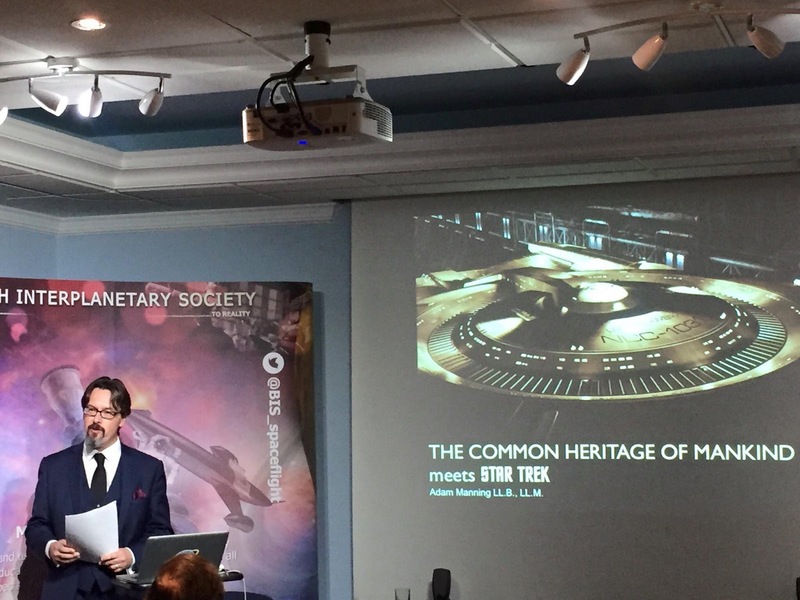 Although some of the details are different, there can be no doubt that there is a thematic similarity between Star Trek’s Prime Directive and Space Law’s common heritage principle. Both ensure that an area of concern shall have special protection and consideration. In Star Trek this area of concern is those parts of the galaxy that are not inhabited by an advanced technological culture capable of warp flight. The Outer Space Treaty is of much broader scope. It applies to all areas of the universe beyond the Earth itself. The common theme between the two is that the area of concern is those parts of the universe that are not already occupied by a sufficiently advanced technological society; that is they are a wilderness that must be preserved, a state of nature that must be allowed to continue, by and large. One of the most attractive aspects of Star Trek, and perhaps one of the reasons is that its appeal has lasted so long, is the optimistic, hopeful future it portrays. It is possible to suggest that the future depicted in Star Trek remains the most popular depiction of our future, especially when considering hopeful, optimistic visions. The Prime Directive is an element of this, as it suggests a more advanced culture that has learned from historical traumas and seeks to act more wisely, with more restraint so as to avoid repeating mistakes of the past. The common heritage principle plays a similar role in Space Law. It calls upon citizens to look beyond their local, national interests and consider not only all of humanity at present but the interests of future generations to come. The drafters of the Outer Space Treaty and the Moon Agreement sought to avoid a scenario referred to by economists as “the tragedy of the commons”. An illustration of this, considered in the nineteenth century, involves an area of common land on which cattle may graze. Each herder, acting rationally, would be inclined to add additional cattle to their herd to gain more from grazing on the land. If all the herders do this, in time the land involved would be over-exploited, to the detriment of all. This point is of general application in a wide range of contexts, including the oceans, the atmosphere, the seabed and so forth. It is very far sighted to assign this principle to the realm of outer space. So far, our Solar System (apart from the Earth) is effectively free from exploitation and, in practical terms, an enormous volume. It will take human civilisations centuries to have reached the end point of its exploitation. Yet we are only at the start of this process and no one can correctly predict how quickly technology might advance. The central problem for Space Law as it applies to extraterrestrial resources is that it is an unfinished legal regime. As the Moon Agreement was not ratified, the international regime set out in Article 11 was not developed in any more detail or applied in practice. What we need is an equivalent to the Prime Directive’s 47 sub-orders! This will take the implementation of the common heritage principle further forward. An example of how this might proceed in practice can be found with the law relating to the exploration and exploitation of the deep seabed, as administered by the International Seabed Authority. My excitement in learning more about Space Law, as a Star Trek fan, has been discovering just how much of the Prime Directive’s farsighted wisdom we already have, bound up in the common heritage principle. As advocates for the settlement of space, we look forward to the greater extension of human society beyond Earth. As this happens, it will be fascinating to see, and even be part of, how the legal regime for Outer Space develops from the initial principles we currently have into a more detailed and working, practical system. Summary: "Extraterrestrial resources" includes territory on the Moon or Mars, the soil (or regolith) of the lunar or Martian surface and asteroids and the minerals that they are comprised of. Space Law's regime concerning the ownership and exploitation of extraterrestrial resources is unfinished. As a result, no one - no nation state, individual or company - can legally own, transfer, lease or sell extraterrestrial resources. After several years of studying Space Law as part of the SPACE Project for the British Interplanetary Society, the following are some conclusions that have been reached regarding the laws concerning the ownership of extraterrestrial resources. 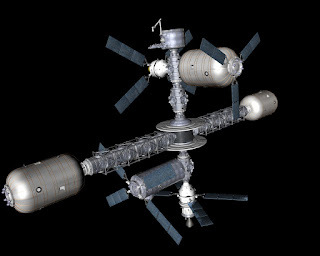 This ownership is an important point when considering the larger scale settlement of space, as the plans involve the use of extraterrestrial resources at some point, whether it be bases or settlements on the Moon or Mars or the use of lunar or asteroid material in building a space habitat. The Outer Space Treaty from 1967 is the most important source of rules concerning the ownership of extraterrestrial resources. Even if it is replaced or repealed, many of the principles found in it would influence Space Law for a long time to come. One of its most important provisions is that no nation state can own territory or land on the Moon or any other celestial object (apart from the Earth) either by a formal act or by physical occupation. If nation states cannot own territory, neither can private individuals or companies or other organisations. Private individuals, companies and so forth derive their legal rights to own land or territory through that state’s legal system. If the nation state cannot own land, it cannot grant its citizens or other legal persons the ability to do so. There is no other source for such rights. Similarly the ownership of extraterrestrial resources, for example lunar or Martian soil or asteroids and the minerals they are composed of, is prohibited at present by Space Law. The laws relating to the ownership of lunar soil and so forth are set out in the Moon Agreement of 1979. Article 11 prohibits the ownership of these resources until such time as an international regime is enacted to administer the use of extraterrestrial resources. This international regime has yet to be enacted. As a result, the ownership of physical extraterrestrial resources is prohibited. Whilst the Moon Agreement has not been widely ratified, enough countries have signed it for it to be enacted by the United Nations. In the absence of any other legal rules concerning extraterrestrial resources, the Moon Agreement is therefore the leading legal authority on this point. There is no legal authority giving anyone the right or power to own, transfer or sell extraterrestrial resources. At best, the legal ownership of extraterrestrial resources is uncertain and questionable. 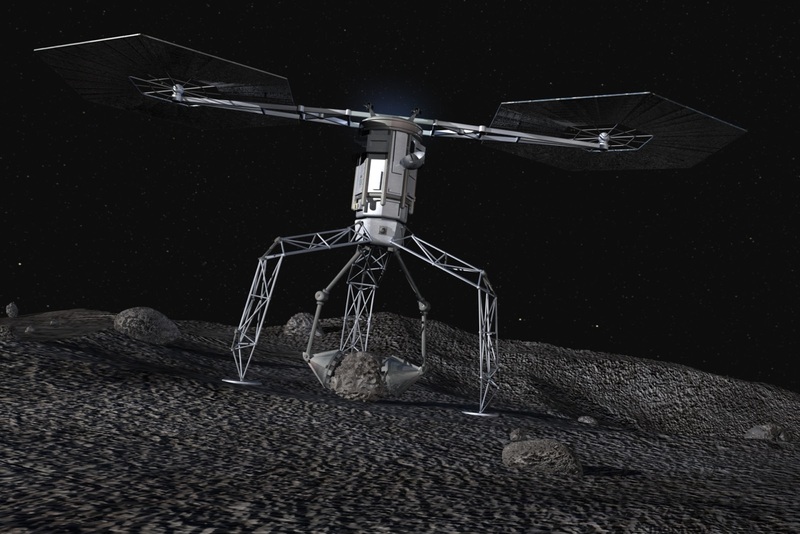 Those investing large sums of money into projects concerning moon or asteroid mining need to take this into account – will they have the necessary legal rights to sell or transfer any materials they obtain on the Moon, Mars or asteroids? They do not have a clear legal basis for doing so. The issue can be seen as one of title to either the territory that is claimed, the minerals extracted or products that are derived from extraterrestrial resources. Space Law does not provide anyone with good title to any of these things, which has implications for the ownership, transfer or even sale of such resources. If you don’t have good title, you do not have anything that you can sell or transfer. New legislative measures from the USA and Luxembourg cannot breach or go beyond these principles. Indeed, provisions of the SPACE Act make it clear that the USA will comply with its international obligations, which must include the Outer Space Treaty. The USA's SPACE Act is a welcome attempt to encourage American space development but it cannot alter the obligations under international law. In this area, it says, in effect, that American Courts can give recognition to American rules about extraterrestrial resources; a purely internal American arrangement. There is no reason that China or Russia, for example, need to give such regulation any recognition. An international regime of some description is needed to administer the ownership and exploitation of extraterrestrial territory and resources. The regime relating to the deep sea bed is directly analogous to outer space, particularly with regard to the focus on mineral wealth, and is an instructive guide to thinking about these issues and future legislation. The alternative is to not have any regime for regulating the ownership and exploitation of extraterrestrial resources. The resources of space then become a race for whoever can grab them the quickest and hold onto them. Any prospect of a rational management of their ownership and exploitation would vanish in such a free for all, with the most powerful nation states taking the dominant role. Practical, imaginary examples help illustrate this point. A company, Lunar Hotels Ltd, builds a hotel on the Moon at great expense. A week later, an armed force from a hostile country arrives and, at gunpoint, takes control of the hotel. Legally, Lunar Hotels Ltd does not have a claim on the land the hotel is built on and so has little legal ability to keep the armed invaders out of the hotel or to claim it back from them afterwards. A company called Interspace Developments plc builds a large space habitat in high earth orbit, constructed from materials mined from near earth objects and asteroids. A year or so later, a force from a new, independent organisation based in space called Astral-One, arrives and demands that Interspace Developments plc hand over the space habitat to them. 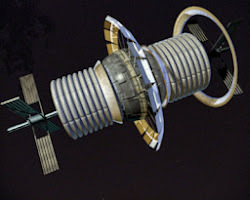 The company has a moral argument (along the lines of "that's not fair") and if suitable weapons are to be found in or on the space habitat, possible military means to respond, but the one thing it doesn't have is a clear legal claim to the space habitat it has created, either in terms of the space or place in orbit that it occupies, or the materials that it is constructed from. Another practical way to think about all this is to imagine it as interplanetary conveyancing. 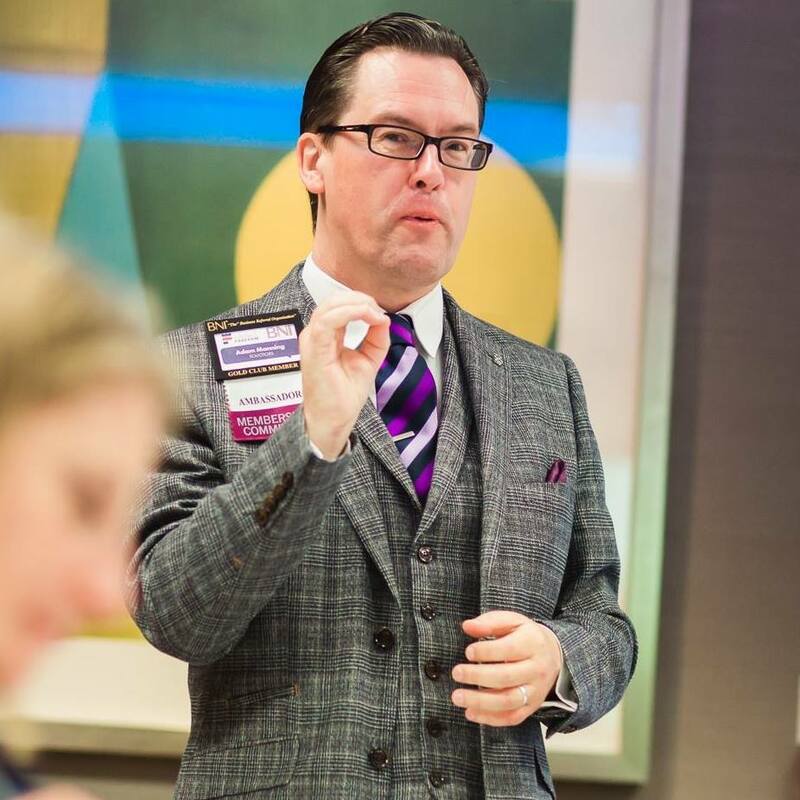 Many people will be familiar with the process of buying a house or flat and using the services of a lawyer to check the title to the property they are buying, to make sure it is worth the large sum of money they are paying. In these terms, if someone wanted to pay £1M to buy a large area of land on the Moon, or to buy a mountain on the Moon (that is the physical substance rather than the territory), a reasonable lawyer would have to advise them that as a result of the difficult legal position at the moment, with the consequently weak ability to claim or protect what you had purported to purchase, it would be a very risky investment. Finally, a company called Mars 4 U Inc sets up business by taking small rocks from the Martian surface to sell to people on Earth and, as a sideline, can grind the rocks up to make statuettes for sale as well. Legally, it has no ability to own or transfer these products. Their customers do not obtain good title to either the rocks or the statuettes in these transactions. There is a question of enforcement of these rules but questions about enforcement bring us back to how uncertain and doubtful the current legal regime concerning extraterrestrial resources is. If space development is to proceed, these questions must be resolved, one way or another, to ensure those investing large amounts of money have adequate protection for that investment. It really is a question of the rule of law - is this going to apply to the ownership or exploitation of extraterrestrial resources, or not? If plans to build bases and habitats on the Moon, Mars or in space go ahead, it would be helpful to those efforts to have a rational legal regime that administers issues of ownership and exploitation so that those investing the considerable time and money involved would be entitled to legal protection. While there are plans for such space development, there is still time to move Space Law in this area on so that a useful regime can be put into place to support these efforts. 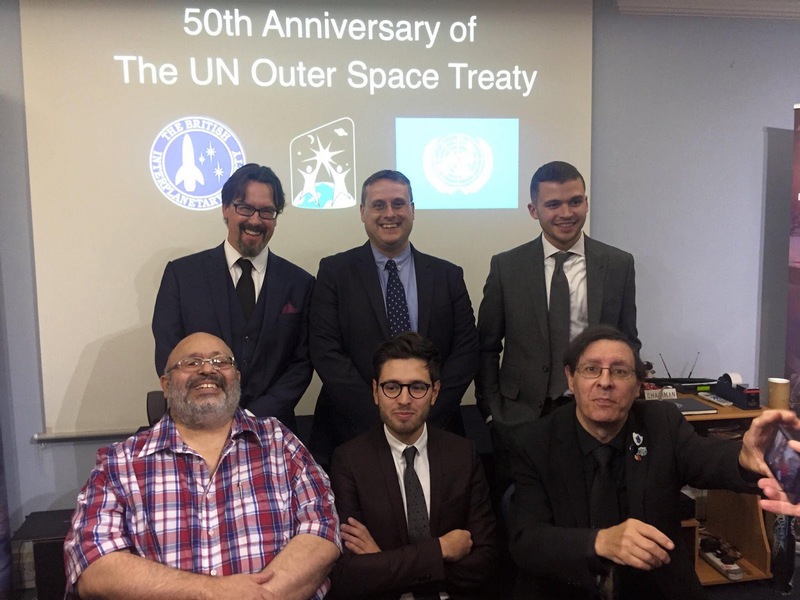 A recent Tuesday in October 2017 saw the headquarters of the British Interplanetary Society in London play host to a one day symposium on Space Law, celebrating not only World Space Week but also the 50th anniversary of the inception of the Outer Space Treaty (OST), the most important source of legislation concerning space. 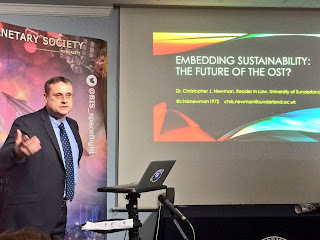 In many ways a new departure for the Society, the world's oldest space advocacy organisation, the day focused on different aspects of the OST. There was the usual warm welcome from the Society, including from the President of the Society, Mark Hempsell and it was wonderful to see the Society's headquarters so full, especially on a weekday. Jerry Stone FBIS, space presenter and a Fellow of the Society, commenced proceedings with an introduction followed by a discussion of the Outer Space Treaty in the context of the SPACE Project, an ongoing study into space settlement that forms one of the Society's ongoing activities. His theme was to consider whether the OST assists efforts to develop space, or whether it hinders such aims. He noted that the construction of large space habitats, as proposed by Dr Gerard O'Neill in his studies from the 1970s, was likely to require the utilisation of large amounts of extraterrestrial resources and so questions about the legality of such efforts were important in considering how such plans might proceed. 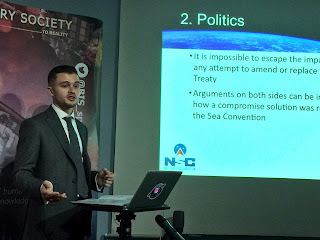 The following speaker was Danny Greenland LLB LLM, a legal researcher with the Northern Space Consortium, who provided a detailed examination of the international regime concerning the deep seabed. 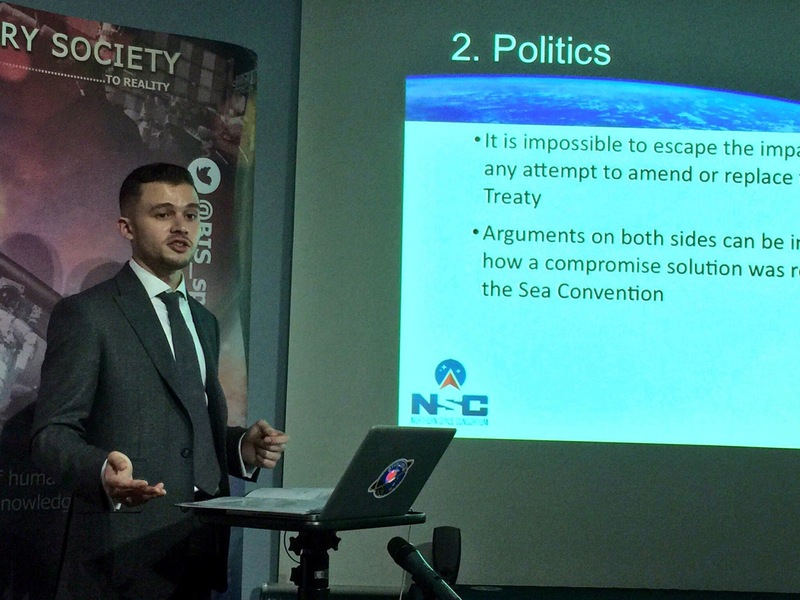 Danny's analysis provided insights into how the legal regime for outer space may develop, due to the similarities in environmental challenges and possible rewards from mineral mining on the seabed and in outer space. His talk described the history of pragmatic compromise that the deep seabed's regime had undergone, balancing the concept of the common heritage of mankind with the aspirations for economic development of minerals to be found on the ocean floor. 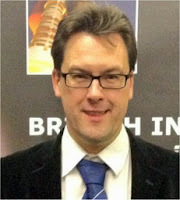 Next was Dr Chris Newman, a leading expert in Space Law, from the University of Sunderland. His fascinating talk was entitled, "Embedding sustainability: The future of the Outer Space Treaty?" and looked at how effective (or otherwise) the OST was in tackling the problem of space debris, which threatens to seriously hamper the development of space. The mitigation of space debris has been an area of interest within the BIS. His conclusion was that this was not a scenario that the drafters of the OST were contemplating when it was drawn up but it was possible to take action nevertheless. The symposium than had a break for lunch and we enjoyed some rather nice catering at BIS. 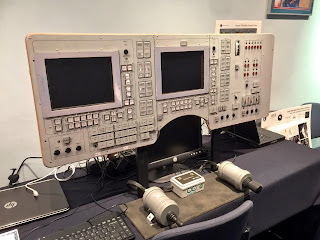 At lunch, I had a look at the Russian launch simulator, which had been used for educational purposes during a recent school visit. After some excellent catering courtesy of BIS, we had the benefit of hearing from Mukesh Bhatt, a researcher and guest lecturer from the School of Law, Birkbeck College. Mukesh's presentation concerned how effective the OST and the way it is implemented is at dealing with challenges or disputes; an examination of the limits of UN Space Law. One point outlined in the talk was that whilst the Moon Agreement, which followed the OST, might not have been widely ratified, it has still been ratified by enough countries to have entered into force. As such, it was an effective Treaty from the United Nations' perspective. Following Mukesh's excellent exposition on a fascinating subject, it was my turn. My talk was entitled "The Common Heritage of Mankind meets Star Trek." I sought to compare Space Law's common heritage of mankind concept with the, perhaps more familiar, Prime Directive from Star Trek. Having given a number of talks on Space Law on these topics, I have gained the impression that many view the common heritage of mankind concept, and the OST and Moon Agreement more broadly, as unnecessary hindrances to the commercial development of space. By using the Prime Directive as an analogy, I sought to persuade the audience that in fact these principles can be the foundation for an enlightened, rational society that seeks to expand into space. We were lucky enough to have a really fascinating talk to finish the day from Raphael Costa, Executive Secretary of the French Institute for Space and Telecommunications Law, who have travelled from Paris for the day, on how the OST might be different if it was drafted today. Interestingly, Raphael noted the many oddities about the Treaty and how in some respects, its drafting was inconsistent with the normal structures of Treaties. It would be written rather differently if drawn up in 2017. The day was highly enjoyable and passed very quickly. As is often the case, there was a lot of energetic discussion about the concepts begin examined and the audience was able to ask as many questions of the speakers as they wished. The BIS welcome extended to a sojourn to a local hostelry after what had been a fascinating day. It was impressive to listen to a number of knowledgeable speakers who went into great detail concerning their subjects. 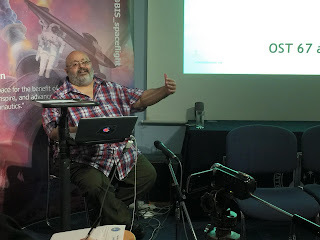 I would like to thank the BIS for giving me the opportunity to give another talk at their headquarters, which, given the BIS' long and illustrious history, is always an honour. Star Trek recently celebrated its 50th anniversary and to mark the occasion, Astrosociological Insights have published an issue containing articles linked to that famous science fiction television series. My article starts on page 8. If you have any comments about this, do let me know. Comparing the two has proved to be a useful and humorous way of understanding the CHM, which is not always the most direct of principles to grasp. The attention that Space Law has been receiving shows no sign of diminishing. I was recently pointed to an excellent article looking at this, entitled "The peaks of eternal light: A near-term property issue on the moon", written by by Martin Elvis, Tony Milligan and Alanna Krolikowski. I ought to mention that Tony is a friend of mine through the British Interplanetary Society and I greatly admire his profound and learned approach to these issues. I thoroughly recommend it to anyone interested in these issues. The article describes regions of Luna, the Moon, that constantly, or almost constantly, receive permanent sunlight due to the relatively small tilt of our sibling world compared to the ecliptic. These points have been given the poetic and entirely suitable name of the Peaks of Eternal Light and they have the potential to be valuable territories as an installation on them, near the north and south lunar poles, will receive solar energy effectively all the time. I was further intrigued by their reference to the Outer Space Treaty ("OST"). As many will know, the OST makes it clear that nation states cannot appropriate, or own, territories on Luna or elsewhere in outer space. According to Article II of the OST, nation states cannot make any claim of sovereignty, by means of use or occupation, or by another means. It is immediately clear to a practising lawyer that this is a total prohibition of any claim to own part of the surface of Luna. Prohibiting a claim of sovereignty by use or occupation means that landing on or building on part of the surface does not entitle you to make a claim for ownership just because of those facts. In English law, for example, this would prevent a claim for "squatters' rights" based on factual occupation of land. "All stations, installations, equipment and space vehicles on the Moon and other celestial bodies shall be open to representatives of other States Parties to the Treaty on a basis of reciprocity. Such representatives shall give reasonable advance notice of a projected visit, in order that appropriate consultations may be held and that maximum precautions may be taken to assure safety and to avoid interference with normal operations in the facility to be visited." The authors seek to use this provision to propose that a "loophole" or ambiguity can be implied that weakens or even avoids the total prohibition on any claim to sovereignty set out in Art II. In brief, the requirement that those seeking entry to a base need to give notice before doing so and cannot interfere with the installation's normal operations suggests to the authors that the owner of a base has some form of right or claim to the area their base occupies as a result. So, for example, this might be used by the creators of a site at the Peaks of Eternal Light to suggest that they have some form of property right to the valuable territory that they occupy. The OST seeks to encourage the exploration and use of Luna and other parts of outer space, as is made clear by Art I, as long as this for peaceful purposes. Nothing in the OST seeks to prevent or discourage peaceful installations, bases or buildings on Luna or elsewhere. Indeed, Art XII itself envisages just this sort of activity. One of the themes of the OST is that exploration and use of Luna, for example, is to be on the basis of peaceful co-operation between the nation states and their citizens. When I read Art XII, as a practising lawyer it immediately reminded me of clauses in land law and especially those relating to landlord and tenant. You may build on the Moon, it suggests, but anyone else can at any time request permission to enter your building. From time to time I have given talks on the Outer Space Treaty and I always refer to Art XII as a practical demonstration of the total lack of any property rights of anyone building on Luna. Think of your home being subject to a law that anyone else, no matter who, could at any time demand entry to your home. I mention this in the context of how unattractive the position is for those seeking to commence an industrial or commercial operation on Luna, involving perhaps mining its resources. In real terms, your ability to keep such an operation secretive to some degree is restricted by this point. Art XII reminds me of typical provisions in a lease particularly because of the important qualification given to this right of entry, which the authors seek to suggest might provide the basis for "quasi-property" rights. Such rights of entry are almost always, except in emergencies, subject to reasonable advanced notice and this is generally for the purposes of expediency, so as to avoid unnecessary difficulties and awkwardness. Turning up seemingly at random and demanding instant entry would be an easy way to create hostility and argument and so unsurprisingly such clauses require the person seeking entry to give reasonable advance notice. Art XII adds to this requirement for advanced notice by stating that this is so consultations may take place and precautions may be taken to assure safety and to avoid interference in normal operations. These additional qualifications further illustrate this point; they are there so that the occupier of a base (for example) must allow entry to other parties if they so require but there ability to do so must be managed in such a way as to avoid confrontation and inconvenience. It seems the length of notice that is reasonable can vary according to circumstances. For example, a complex and potentially dangerous industrial process at a base could lead to a longer period of notice prior to entry than say an innocuous astronomical station. Far from giving the occupier of a base any sort of claim to property rights, these qualifications on the right to entry merely seek to ensure that it is exercised in a way that helps to fulfil the broader aims of the OST in peaceful co-operation between space explorers and users. Ultimately, the occupiers of a base on the surface of Luna would not be able to rely on these provisions to prevent someone else entering their premises completely as at some point, no matter what the circumstances, a reasonable period of notice will expire. The requirement to give notice before entry does not, by itself, qualify or weaken the total prohibition of any claim to sovereignty set out in Art II OST. Against Art II's total prohibition on property rights of any sort, the requirement to give notice in my view simply fails to provide a firm, or indeed any, basis for any claim or right that can be founded in law. 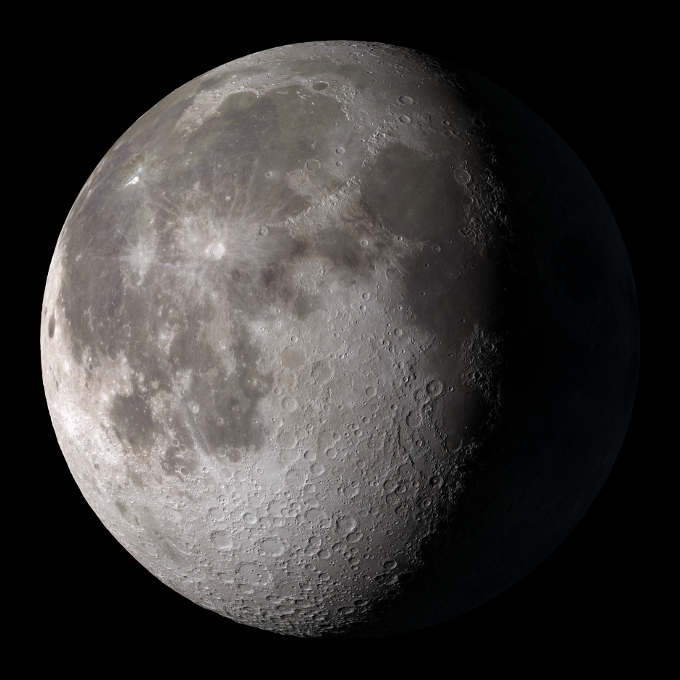 Of course in reality the creator of such an installation or base may assert their claim in practical terms based purely on their occupation and this might have a great deal of force to it, especially while the surface of Luna remains largely unclaimed. Yet this would not be a legal argument. There would be no basis for such a claim in the OST or Space Law more generally. Any attempt to maintain occupancy or control of an area would have to involve the use of non-legal means, which would presumably start with simply refusing to allow anyone else any form of access. The authors seek to partially ground their submissions in a broader jurisprudential theory often associated with Ronald Dworkin. If there are seeming lacunae in the law, this theory suggests, a Judge can utilise broader social and cultural norms to consider the point in more detail. 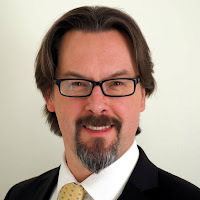 If a Judge has perfect wisdom based on a perfect understanding of all cultural, social and other norms, such an imaginary champion being referred to as Judge Hercules, they will undoubtedly arrive at the perfect answer to any legal problem even if the primary legislation being considered seems ambiguous. In reality, actual human Judges may not arrive at the same answer as Judge Hercules, or even each other (as is often the case), but there is at least the principle that there is a perfect answer to each legal question. This attractive and comforting theory has some practical underpinning in the noted principle that Judges (at least in the jurisdiction of England and Wales) are expected to arrive at a judgement on a legal dispute even if the law or evidence or both have unsatisfactory elements, such as gaps in the primary law being considered. Yet this does not mean that Judge Hercules can therefore be expected to make the law up in the absence of legislation. A Judge seeking to resolve a dispute about access to the Peaks of Eternal Light would have to, at some point, note that the regime of the OST only goes so far and then stops. From the perspective of someone seeking to exercise property rights over the surface of Luna , the law states that they do not have any and the Judge cannot go any further than that. The authors speculate that the Chinese government could commence a mission that would conclude with a site being installed at one of the Peaks of Eternal Light and might then seek to rely on the OST in the way they propose to exclude anyone else from this territory. To bring matters to a head, let us say I form a company registered in the jurisdiction of England and Wales and I then obtain the appropriate license from the UK government in accordance with the Outer Space Act 1986 to carry out operations in outer space. I decide that this company is to land a human mission near the Peaks of Eternal Light and then seek access to the Chinese base in accordance with Art XII. If, for whatever reason, the Chinese government refute my request after a reasonable period of notice has expirerd, I would have to communicate my displeasure to them and, to take matters further, I might have to apply through the Chinese Courts for some form of a declaration and injunction that the Chinese government must comply with its international obligations under the OST. If this was unsuccessful my ultimate recourse would be through the Legal Subcommittee of the Committee on the Peaceful Uses of Outer Space at the United Nations. Whatever the course or outcome of these proceedings, it is important to note that at no time has the Chinese government, the UK government or my company gained any sort of ownership or rights over extraterrestrial territory. In this example, the Chinese government have not gained any legal rights; they have simply refused to allow me to exercise my legal right of entry. What is the way forward, given that the OST and the current Space Law regime more generally does not provide any particular mechanism for considering these issues? In looking into this, I have been researching the law of the sea bed. Here, the International Seabed Authority ("ISA") manages the exploration and exploitation of the deep sea bed. This was created by the United Nations Convention on the Law of the Sea, also known as the Law of the Sea Convention. The exploitation of the mineral resources in polymetallic nodules to be found on the sea bed is a key area that is managed by ISA. ISA licenses operatives from convention countries to carry out these sorts of operations and emphasis is placed on environmental mitigation. ISA has its own enterprise organisation to carry out such exploitation as well, although in practice it has yet to carry out substantial work in this area. Though the ISA and its activities are certainly not free from controversy, it does provide a practical example of how the exploitation of Luna, along with outer space more generally, might proceed. Given the complexities in this area, the authors of the article are keen to qualify their conclusions about the law and those interested in this field will value this detailed examination. If the resources of space are to be utilised, it will be interesting to see how the legal regime develops to manage these activities. I was delighted to be asked to contribute to Astrosociological Insights, the newsletter of the Astrosociological Research Institute, recently. 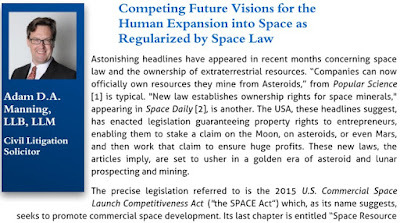 The link at the bottom of this article takes you to a pdf edition of their latest newsletter and my article on Space Law starts on page eight. The research carried out for this article was part of my work for the study group for the British Interplanetary Society on space settlement. Astrosociology is according to the ARI a relatively new field, and is defined by them as the study of astrosocial phenomena (i.e., the social, cultural, and behavioural patterns related to outer space). The study of Space Law clearly has a home within this area of research. 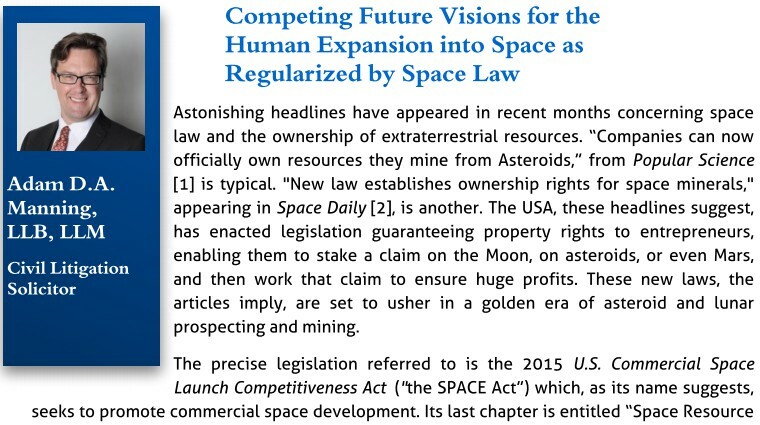 This particular edition of Astrosociological Insights focusses on space settlement and my article is entitled, "Competing Future Visions for the Human Expansion into Space as Regularized by Space Law". It is an examination of how recent American legislation, and the attention given to it, compares to the background of Space Law concerned with the exploitation of extraterrestrial resources. This edition of the newsletter commences with an article from George Zamka, NASA astronaut and veteran of two Space Shuttle missions, on a return to the Moon and also includes an article from the wonderful Al Globus on the minimum size needed for an early space habitat. With other articles on the role of politics and the arts in space settlement, I am very flattered to be included. A video scrapbook of bits and pieces from a visit to the British Interplanetary Society (BIS) in early 2016. 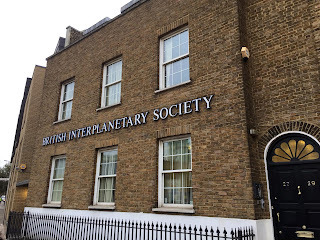 My visit was to take part in a conference for the SPACE Project, a study group within BIS re-examining the space colonies studies from the 1970s. Island Zero Alpha is an original space habitat design from the study group on space settlement within the British Interplanetary Society. Assembled and stationed in low Earth orbit, it is 115 metres in radius. The ring of habitat modules rotates at 2 rpm and this produces a pseudo-gravity of around 0.5g on the floor of the modules. The idea behind Island Zero Alpha is to move up to larger habitats than the International Space Station and to learn more about the effects of pseudo-gravity on humans in space. The station is expected to have a crew of around fifteen to twenty. The spiral tunnels leading from the central hub to the habitat modules on the ring are to ensure a graduated transfer from 0g to 0.5g in the habitat modules. The ring running round the habitat is primarily for emergency access. Please watch in HD if possible. 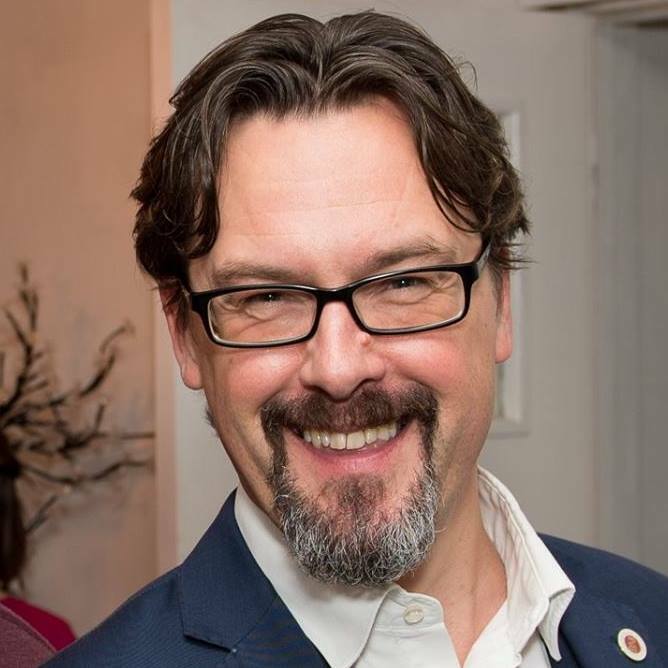 I was delighted to take part recently in a discussion about Space Law as it applies to space resources and settlement for the Voices from L5 podcast. With me were PJ Blount and Christopher Newman, both authorities on the legal aspects of space development. We discussed the recent American legislation referred to as the SPACE Act 2015 and then talked more speculatively about the possible nature of a constitution for a space habitat. Voices from L5 is brought to you with the assistance of the National Space Society. Space Station Zero Alpha - the computer game! As a bit of fun, I've been undertaking a wonderful online course on computer science called CS 50. The first project involves creating a program in Scratch, a language designed for beginners in computer programming that does a lot of the work for you. Looking for inspiration, I decided to create an updated version of an old computer game I created back in the eighties, during the home computer craze, called Space Station Alpha. This was a game written in under 16K for the ZX Spectrum. This new version is a lot faster and I really wish I had these sorts of facilities when I was a teenager! I've used the graphics from current work on my space settlement film. It's a very simple game. The player is in charge of the defences of Space Station Zero Alpha, the last space station left to protect Earth (or Sol III as it's called in the game). You have to blast the invading Centaurian Space Destroyers before they either destroy your station or dock with it and invade. If your damage goes over 100% or the Centaurian Space Destroyer reaches the docking port, you've lost. You have to survive twenty waves of invaders to win. Good luck and let's hope you save Sol III! A first step to the settlement of space.